Paul Walker’s death has spawned an endless stream of memorials across the various social media networks but it is important that those street racers who idolized Walker and molded their lives around the street racing culture take this as a bit of a wakeup call. Let me start by saying that I am not looking to offer up a piece chastising street racers in light of Paul Walker’s death. I admit that I’ve done plenty of street racing in my days so it would be hypocritical for me to criticize other street racers. This isn’t about telling people not to street race – this is about reminding everyone out there who occasionally opens up their vehicle outside of a closed circuit that there is a very real possibility of losing your life should things go wrong. The details surrounding Paul Walker’s death are still fairly sketchy but we know that he was in the 2005 Porsche Carrera GT owned by friend and business partner Roger Rodas. It is believed that Rodas was driving but there has been speculation that Walker could have been behind the wheel but in any case, after leaving the car show held by Rodas’ business in an effort to raise money for charity, that 2005 Porsche GT slammed into a light pole and then a tree before exploding into flames. Speculation suggests that there had been some spirited driving leading up to the accident and while it does not seem to have been a street racing incident, there seems to be a good chance that the Porsche was being driven excessively hard for the confines of the tight industrial complex in which the car crashed. Ive read plenty of other information around the internet that may or may not be true including the fact that the area in which the two crashed has been known for street racing and in the area where the Porsche crashed, there were tons of burnout marks that led the police to believe that someone had been doing burnouts in a figure 8 pattern…but I'm simply mentioning those bits of information for the sake of discussion as it is unclear whether or not they are true. Regardless of what led up to the accident that killed Paul Walker and Roger Rodas, we should consider the fact that the Porsche Carrera GT is far better equipped to engage in high performance driving than many of the cars called upon by the riskier street racers. Also, whether Rodas or Walker was driving the car at the time of the accident, we know that this car was being driven by a man with extensive high performance driving and racing experience. If anyone is going to be “safe” when street racing, it would be someone who has made a name for themselves as a professional racer while piloting a supercar designed to be pushed to the limits. 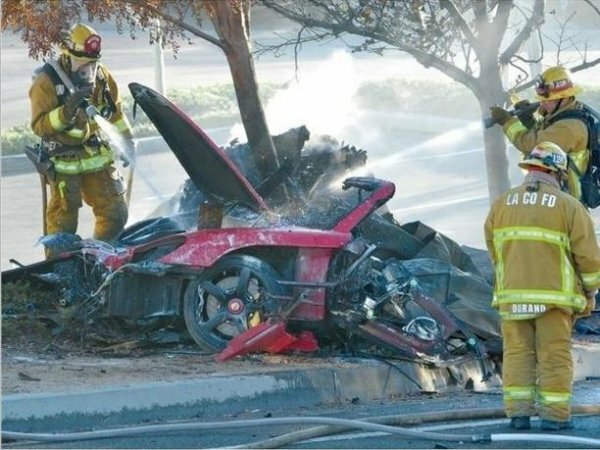 Even with this in mind, some unknown problem or error sent this supercar careening into a light pole and a tree and the end result was the death of one of the best known car guys in Hollywood. Something as simple as a spirited blast through an industry complex with a trained racer at the wheel of a car modeled after successful racecars ended in the death of two men and those street racers out there who work to model their lives after Walker’s character Brian O’Connor should keep this all in mind next time they push their 2002 Mustang GT or Honda Civic Si to- or beyond – its limits. Again, this isn't about me using Paul Walker’s death as a pulpit where I can bash street racers and plead for them to change their ways but instead – I urge racers to use better judgment when picking your battles while behind the wheel. While I have little doubt that there are those critics out there who scoff at my suggestion of responsible street racing, those who partake wisely should know exactly what I am talking about. Those who street race and regularly find themselves in “close call situations” are not making good decisions and in doing so, they are putting themselves and others at higher risks. Paul Walker’s life inspired countless young gearheads to get into the performance driving world. Paul Walker’s death should remind all of us that every time we race – no matter how well trained we are or how well prepared our vehicle is – there is a chance that we can pay the ultimate price. Racing always has the possibility to end in tragedy but racers can take measures to ensure that when racing, they are the only ones at risk. From everyone at TorqueNews.com, our condolences to the families of Paul Walker and his friend Roger Rodas. As Porsche notes in its owner's manual, you can't overcome the laws of physics. Doesn't take much to launch a sports car into trouble and combined with a high rate of speed it's a formula for disaster. Keep the racing to the tracks - not local streets. Too much can go wrong in a split second. Keith makes an important point, but there is more. First, there are no poles or trees to hit at racetracks. There are barriers that help save your life. More importantly, this was a very, very wealthy 40 year old man. WTF is he doing getting his yayas out on public, or even private property? Rent some track time, join a club, go to a Skip Barber school, join a race series, do all of that. 40 year olds are middle aged. That is not a time to be doing stuff expected of a 19 year old. There is no excuse for nearly "old" rich guys who die in road racing, or road speeding or whatever you call it. That it was performance car makes it worse, not better in my opinion. The only good in this is that nobody innocent got killed. There is a very important lesson in this event that I learned as a teenager. I received great advice from a professional (though not very succesful) race driver who was a friend of the family. Around the time I got my drivers license, he said to me, "There are two ways to get into a single-car accident. You can exceed the capability of the car, or you can exceed the capability of the driver." A very simple statement, but thinking about it, and keeping it in mind has protected me and my cars for decades. Forgetting it once cost me a car, but left me fortunately unscathed. Would Tesla Model S Be Able To Support Porsche Taycan Type Charge Rate? How Can An Electric Sport A Turbocharger? Think About It!